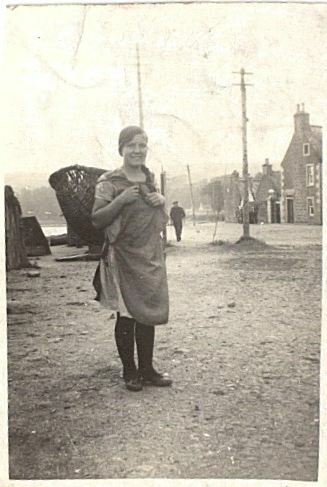 Andrew Bathie's Grand Aunt Esther (Alice) Hossack with fish basket in Shore St. What is the extremely tall post behind her for, and what are the buildings we can see to the left of the fish basket? The tall post is possibly either an early radio antenna or signalling mast (flags or cones) used by the Cromarty Coastguards. Seabank House belonged to Capt John Watson (Bodders) who rented a room out to Mrs MacKenzie and her sister Bella Beaton as a grocer and general store from the '30s to the late 50s, both from Kyle of Lochalsh, and fluent Gaelic speakers. My sister Emily Taylor lived at 5 Duke St, then moved to Stourport on Severn, Worcestershire in 1934 when she was 16. I found her old address album showing a Lily Hossack living at 4 Shore St, was she also a grand aunt of yours? Thanks Jean, Lily is not one of my grand aunts but I'm sure she's related. Dad can just remember attending her wedding and can also remember her siblings Elsie, Rosie and Jim. Jim was apparently a veteran of the battle of the river Plate and was decorated for his actions. I'm trying to tie up a few loose ends and would be keen to add Lily's family if anybody has the details. Jean, I've made the connection Lily will be my 4th cousin twice removed!